Street harassment is unwanted or unwelcome and ultimately determined by those who experience it. Nearly every woman will face street harassment in her life at least once, and many face it on a daily basis while commuting to and from school and work, often leading them to feel uncomfortable and unsafe in public. 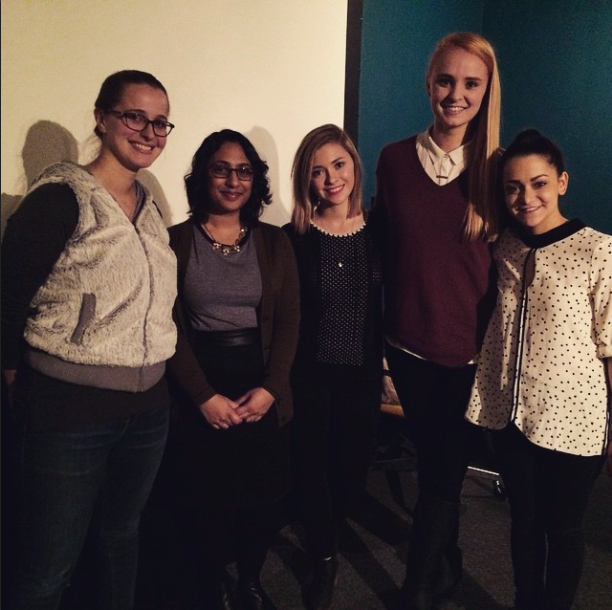 On February 8th, I had the opportunity to attend a seminar held at Chicago Filmmakers presented by Hollaback!’s Deputy Director, Debjani Roy, to learn more about the organization and the problems with street harassment. I would love to share some of what I learned about how us ladies can leverage media and technology to end street harassment. Hollaback! is a not-for-profit organization created to bring attention to street harassment, start public conversations, and empower women to speak up about it. Ultimately, the goal is to ensure that every woman feels safe in public space. Hollaback! operates though a series of websites in 79 cities around the world, as well as a mobile app called Hollaback! The websites and app provide platforms for victims of harassment to share their experiences and connect with others. Users are able to instantly document situations of harassment with a short post or photo, and locations of harassment are pinned on a publicly viewable map. The impacts of street harassment go beyond physical discomfort. As these acts are allowed to continue without consequences, we perpetuate the overarching forces of misogyny within our society. Victims can be affected on a psychological level as well, experiencing discomfort, guilt, and shame along with their objectification. It can even cause problems in victims’ social lives, causing relationships to suffer. For example, a woman may not feel safe going out with her friends because it means riding the train alone at night. I was most surprised when I realized the financial impacts. If a woman no longer feels safe commuting to work, it could mean changing jobs, moving to a different location, or taking more cabs instead of public transit. Exposing regular street harassment gives us the ability to problematize those experiences and see them as part of a larger injustice. Sharing experiences transforms the way people feel and think about street harassment. Once we problematize street harassment and change the way society feels about it, we are able to change the behavior and stop harassment from happening. This resonated with me particularly because that is the way that Obvi, Were The Ladies works to fight for equality. We share our experiences in hopes that others can relate and then feel empowered to share their own. Distraction – Stand between the victim and the harasser or make a scene. Delegation – Find someone else in the scene that would be able to effectively stop the harassment. Delaying – Start a conversation with the harasser and give the victim a chance to get away. So, how can you (and we) help now? One very cool part of Hollaback!’s mission is to not only expose the problem, but also looking toward finding a solution. Hollaback! believes that in order to end street harassment we must change behavior instead of looking to law enforcement. We need to continue the conversation about street harassment and spread awareness. Using our resources to track situations of harassment is a great way to keep spreading awareness. The stories shared on Hollaback!’s platforms are often given to local legislators who have the power to help take more formal and publicly visible action. You can also volunteer your skills, talents, or funds directly to Hollaback! to continue building community and make an impact. Posted in Feminism, Misogyny, Pop, Self, Struggles and tagged Chicago Filmmakers, empowerment, Feminism, hollaback, inspiration, motivation, street harassment, womanhood, yesallwomen. Bookmark the permalink.